That’s what my Mom told me earlier this evening. I also wanted to drink tonight so I made it happen. Here’s a three ingredient vegan cocktail that is super easy to make. 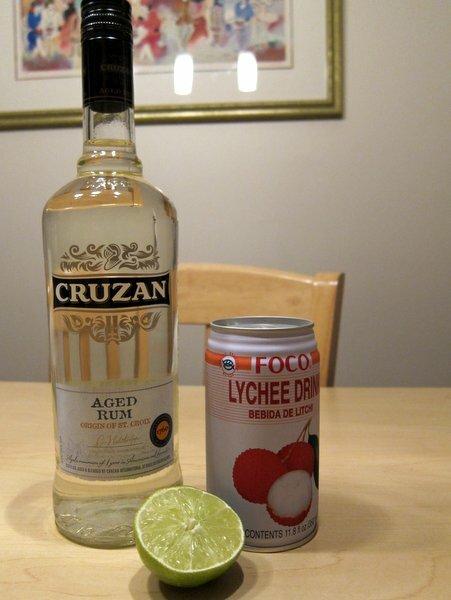 Pour the lychee drink into a glass, add the rum, squeeze in a lime wedge, stir… and then drink! This cocktail is completely deceiving. I can only taste the lychee juice but I sure am feeling buzzed. The only thing missing was some fresh lychee fruit to toss into the glass. I am currently heating up some samosas by Bombay Bites for us to enjoy with these. Stay tuned for my review in a future blog post. So … if I drink this, I can have a bunch of girls here at my place too? MMMM! Sounds exotic and delicious. Because you are so great at introducing me to new vegan options, I’m nominating you for a Beautiful Blogger Award. If you’d like to participate, go to http://amberstartstoday.wordpress.com/2012/10/14/hey-did-you-happen-to-see-the-most-beautiful-blogger-in-the-world/ for details. Thanks for your great work!